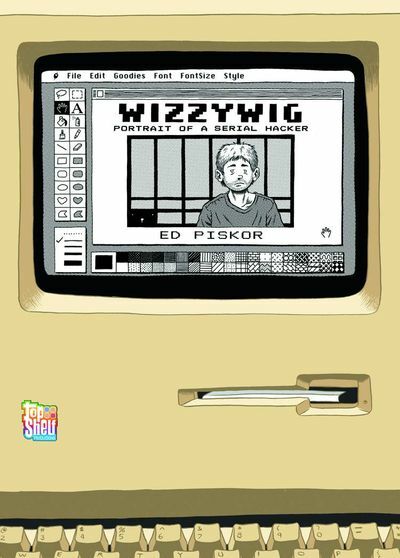 Ed Piskor’s graphic novel Wizzywig comes out this July and is available for pre-order on Amazon. In Ed Piskor’s Wizzywig, it all starts when main character Kevin Phenicle tries to cheat his way out of paying bus fare. This leads to Kevin becoming a computer hacker and eventually a convicted felon. Throughout the story, readers get to see Kevin transition from a timid, bullied schoolboy to an over-confident person on the verge of spending his life in jail. In the graphic novel, the author uses a colour drawing for the cover, but the rest is in black and white. This gives the impression of holding a photo album in your hands. The drawings in Wizzywig tend to be realistic, as they help depict the life of Kevin, without exaggerating too much on detailing. What is most noticeable, however, is that Kevin’s eyes are completely white, they do not have pupils, unlike the other characters in the book. As part of Kevin’s probation, after he is caught, he is asked to put everything hacking related aside. His new life without the use of technology leaves Kevin no choice but to simply adapt. What is so great about this story is that anyone can relate to it, there are no boundaries set to Wizzywig, everyone can have their own interpretation of the story, which is why it makes it such an interesting graphic novel to read. These different ways of how people see Kevin, make us rethink the vision we once had of him. Can we truly call Kevin a criminal? Or can we say that he is talented in his own way? Those questions are left to be answered by the reader. Wizzywig is rumoured to be based on the real life story of Kevin Mitnick, a professional hacker who was arrested by the FBI in 1995. Though Piskor never confirms this, the fact that they share the same name and are both professional hackers is something that should not be left unsaid. Also some panels displaying the words ‘Free Kevin’ may refer to the movement made in the 90’s, which petitioned to give Mitnick a chance to prove his innocence with a trial. Wizzywig demonstrates how life can be complex while surprising us when we least expect it. We may have a lot of challenges and obstacles coming our way, some brought on by ourselves in the same way Kevin brought misfortune on himself. We learn from our mistakes and Kevin is a great example of that, proving that you may need to fall at one point in your life in order to get back up on your feet. For more comics visit www.wizzywigcomics.com.